From Highway 199, turn east on Watkins St and drive two blocks to the park. 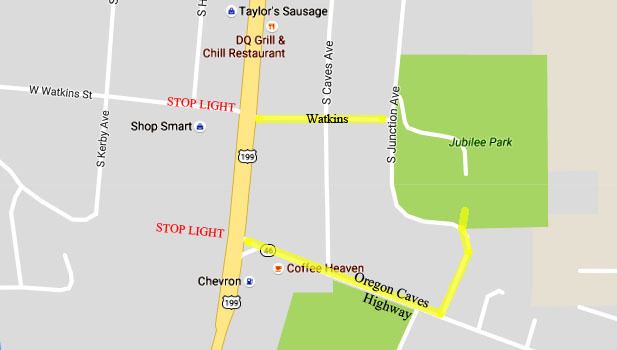 You can also follow Highway 16 (Oregon Caves Highway) for two blocks and turn left on Junction Avenue. Jubilee Park is two blocks east of Highway 199 and can be accessed by Watkins Street or from Highway 46 (Oregon Caves Highway) on Junction Avenue. Jubilee Park is Cave Junction’s only developed city park and is the central hub for community activities including family gatherings for picnics, Little League baseball, Car Show, Labor Day Festival, Concerts in the Park, Alumni Association Reunion, Children Fair and Pet Parade. No entrance fee, restrooms, tennis courts, skate park, ball field, amphitheater, covered pavilion, picnic tables, and playground.